Well, hello peaches! Welcome to the Stampin' Up! Love What You Do Suite Early Release Hop, held by our very talented and creative team of Artisan designers. 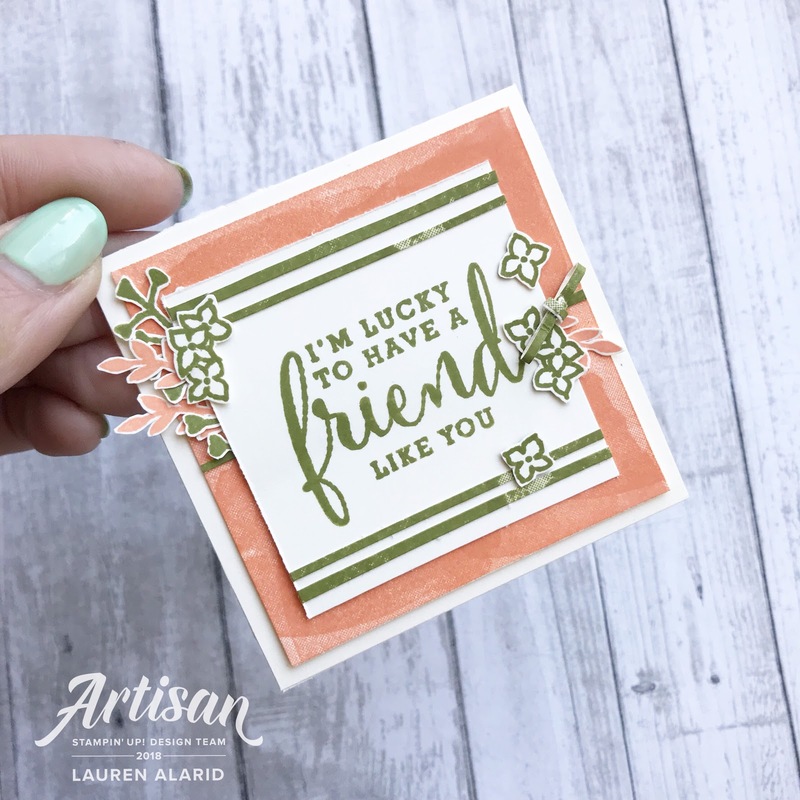 I'm always excited when Stampin' Up! is getting ready to launch it's new catalog in June. There are so many new and gorgeous products to look forward to, but in the meantime, Stampin' Up! has released one product suite early to give us just a little sampling of what's to come. This suite was designed to cater to and celebrate each and every crafter. After all, we crafters and our mutual love for creativity are the reason for the existence of this amazing company. Through it we have built long lasting friendships. It is definitely something to celebrate! These new products will be available in three different bundle offerings: For beginning crafters, the "Just Getting Started Bundle, the "A Little More, Please" for those who want just a little bit extra, and for the avid crafter, the "Gotta Have It All Bundle". For demonstrators: “Preorder the Love What You Do Suite "New" and "Avid" Bundles. The demonstrator preorder period is April 9th - April 30th 2018 (A la carte only available during preorder period). Get these new products in your hands to prepare for classes/events and customer launch May 1. Now let's check out some projects made with the "Just Getting Started Bundle (149524)". As you can see, there are so many possibilities with these gorgeous new products. These samples are designed with the "new crafter" in mind. They have all been created using only products included in the "Just Getting Started Bundle", so you can very easily recreate these projects on your own or with friends. For all of my cards today I'm using the Love What You Do Stamp Set (148042) from the "Just Getting Started Bundle". I started by creating a stamped banner. 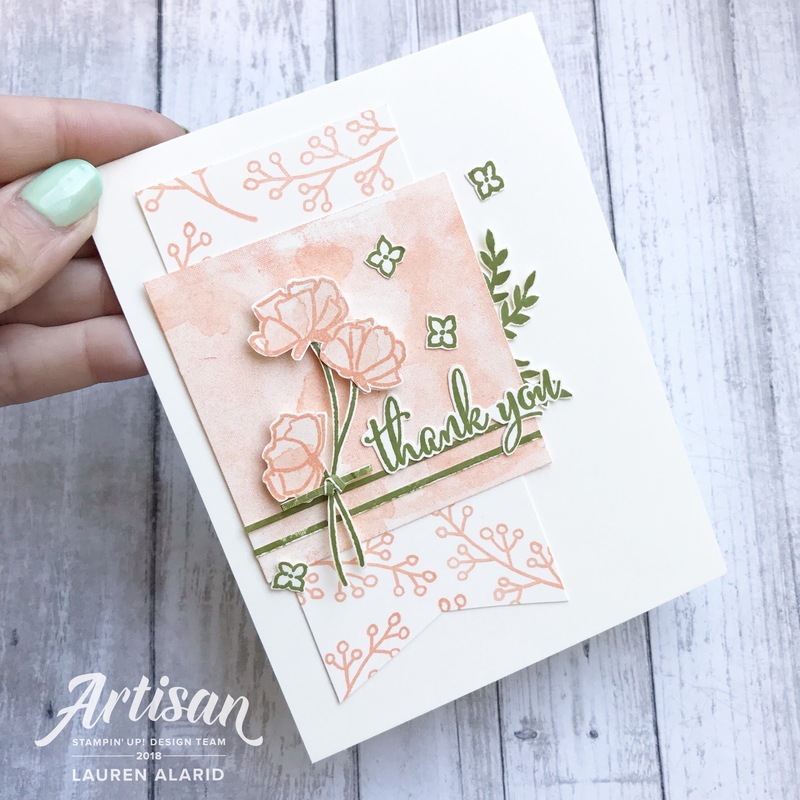 I used the luscious new In-Color Grapefruit Grove Ink Pad (147142) to stamp one of the floral images randomly all over it. Then I wanted to have a somewhat solid background for my next layer, but in sticking with only using items from the "Just Getting Started" Bundle, I would need to get creative. 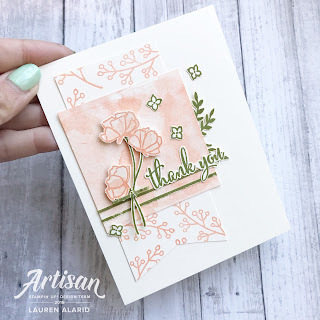 I decided to create my own textured background paper by taking the largest "watercolor wash looking" stamp, inking it up in the Grapefruit Grove Ink, stamping off (for a more subtle look), and then repeatedly stamping it all over my cardstock (in second generation stamped ink), until I had covered every part of my layer.I stamped a few flowers, some in Grapefruit Grove and some in Old Olive Ink (147090), and cut them out and layered them on my card. I tucked a few Old Olive stamped sprigs behind the main focal layer and added my sentiment. I wanted my little bundle of flowers to have a bow, so I got creative again. I took my Old Olive Ink Pad and inked direct to paper to get a saturated color on the Very Vanilla cardstock (101650). Then I cut very thin strips of the inked carstock, distressed it carefully till it was bendable and made a small bow with it. For my next card I did the same thing as the previous card for my Grapefruit Grove inked panel except I didn't stamp off. I stamped the watercolor wash stamp in full strength. I inked up some cardstock in Old Olive Ink and cut it into thin strips for a striped border on the top and bottom of my top panel. I added another "bow" on this one as well. 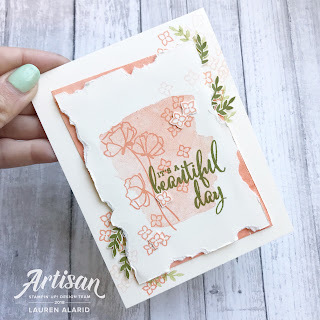 I just love the artistic look of that watercolor wash stamp. It's so great to see the perfect beautiful mix of floral with artistic stamps. That just makes this set so versatile! You just can't go wrong with this set! 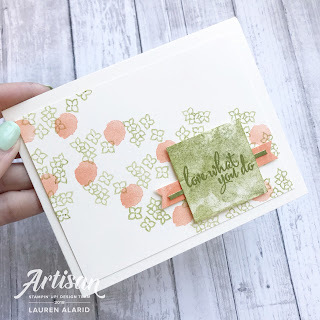 For the third card I basically took one of the floral images and stamped it in a diagonal angle across my card panel in Old Olive and then the small rounded stamp to follow the pattern in Grapefruit Grove. 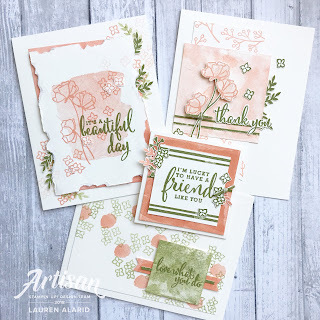 I finished it off by using the same rounded stamp to repeatedly stamp all over my sentiment panel in Old Olive until it was covered with the pattern and I love all of the texture that created.Think of all the possibilities this set with all of these different images offers! For my final card I created a more ripped, distressed panel behind which I added another direct to paper Grapefruit Grove Ink colored layer. I stamped the large watercolor wash stamp onto my distressed panel in second generation (stamped off once) Grapefruit Grove Ink. Then added a few flowers. I tucked a few Old Olive leaves behind my top panel, and finally I stamped my sentiment in Old Olive. These bundles offer so much! Whether you are just beginning your crafting journey with limited supplies or you are an avid crafter who loves a challenge, there's something for everyone! I hope you have enjoyed all of today's cards and designs. Keep hopping along and check out my other fellow teammates’ pages. There's a ton more inspiration to be had! Make sure to check back in May for more inspiration using the Share What You Love Suite of products! I’ve listed all of the products and bundles, along with a list of all of my fellow Artisan teammates below or you can just click the link below to hop to Linda Van Wely-Zwolle. Lauren, I love your cards and especially the watercolor wash look on the background and the torn paper...wonderful. Thanks, Connie! You know I love my watercolor washes! Wow Lauren! I'm so inspired by you. Hard to believe these cards are just stamps, ink and paper. Yes, it's truly amazing what you can do with minimal supplies. 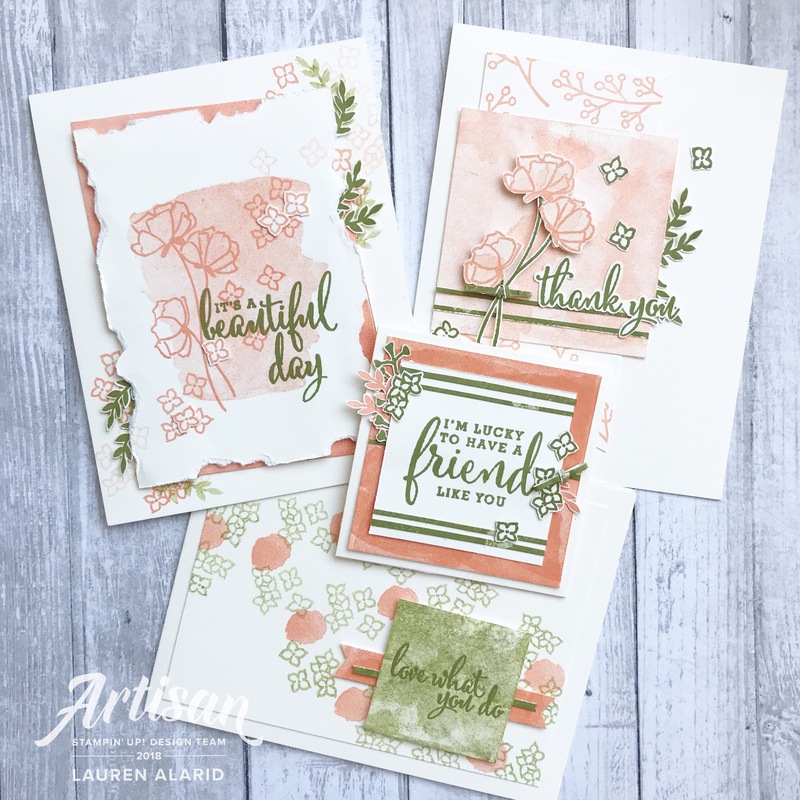 So lovely cards, Lauren! So soft and beautiful! Thanks, Emma! necessity is the mother of inspiration, right, lol! These are just cute Lauren! You did a great job, love your cards! Simple but just stunning! It's really so very refreshing for your creative mojo to work with the minimal supplies and challenge yourself. Thanks, Kim! What gorgeous layers and details in each card. You have made total perfection with the limited supplies--way to go! Awe, thanks so much, love! I was definitely challenging! I can't hate on anything you make. I think it's literally impossible. Not that ever would ;) Lol. Fabulous work, my friend. Oh, haha, Susan! You're too sweet! Thank you! Thanks, Sarah! I'm so glad I had this challenge! Beautiful ideas for this bundle! To think you made these with just stamps, ink and paper - you're amazing! Oh, thank you, Jennifer! I'm pretty amazed myself, lol. My favourite is the square one! All ideas are wonderful, but this tiny cute card is so so nice!